Buying a new set of tyres for your vehicle need not break the bank and at ATS Euromaster we stock an excellent range of low cost tyres to suit you. Should you need a new set of tyres quickly then budget tyres could be for you, especially if you are only an occasional driver or need a new set for your second car. 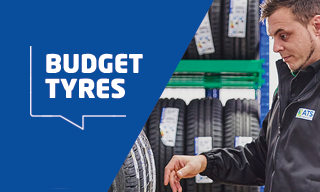 Among the brands that provide the best budget tyres that we have on offer are Autogrip, Evergreen, Goodride, and Rapid. Choosing a new set of tyres can be a delicate balancing act between getting something that delivers the level of performance that you need, and also getting a good deal for the amount of money you're spending. If you need your car to make a lot of short journeys and have found yourself caught out with a puncture and a need to replace your tyres quickly, then opting for cheap tyres could be a good solution especially if you don't have an emergency fund set aside for your car. Or if you have a second car that does not get as much use then opting for budget tyres is more likely to suit the vehicle for the amount of mileage it does. While premium tyres offer the best performance and handling for high speed driving and those who travel frequently on motorways, if you are the kind of person who only makes short journeys whenever you need to, then cheap tyres may be a better option for you. Budget tyres are known to wear out faster but if you are not going to be doing a lot of driving before you change vehicles then you are unlikely to see the benefit of purchasing more expensive tyres..